Evergreen foliage on a very attractive flowering shrub make Leucospermum oleifolium a great garden plant. It is the flowers that make this plant so good, they change colour as they age from yellow to orange and finally red. In full flower as the blooms appear in clusters it looks like the plant is multicoloured. 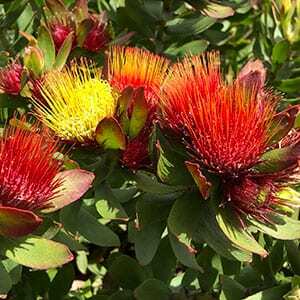 In the garden like other Leucospermum varities, Leucospermum oleifolium can be used as a feature plant or even a hedging plant if you have the right conditions. So why is this plant not widely grown? Because it it is very fussy about soil and moisture. This is a plant that does not grow well in humid climates. It also must have a very well drained soil, slightly on the acidic side. It grows best in soil that is sandy, free draining with a little aged compost added. For best results, mound uptake soil to make the drainage perfect, or plant on a slope which can have the same effect. Also try to plant in a position that is protected from strong winds yet has good air flow. You can mulch around the plant to help retain just a little moisture. You will need to water a little over the frost few summers, being careful not to overwater. Flowers – Opening yellow changing to red.